Adefila, A. (1974) “Nigeria and Israel: Continuity and Change in their Relationship”. African Review 4 (1):616-640. -------- (1979) “Israel and Nigeria”. International Studies 18 (4):621-640. Akinyemi, B. A. (1970) “Foreign Policy and Federalism: The Nigerian Experience”. Ibadan: Ibadan University Press. Aluko, O. (1981) “Essays on Nigeria Foreign Policy”. London: George Allen and Unwin. Babangida, I.B. 1985. “Review of Nigeria’s Foreign Policy in 1988”. Nigerian Forum. Nov/Dec. Bartes, M. (1968) “International Encyclopedia of the Social Sciences”. New York: Macmillan & Free Press. Vol. 5 & 6. Bello, A. (1962) “My Life”. London: Cambridge University Press. Chick, J.D. (1971) “The Nigerian Press and National Integration”. Journal of Commonwealth Political Science 2: 126-138. Chidozie, O. (1988) “Domestic Economic Interest Groups and Foreign Policy” In: Economic Development and Foreign Policy, G. O. Olusanya et al. Lagos: Nigeria Institute of International Affairs. Claude, I.L. (1965) “The Impact of Public Opinion upon Foreign Policy and Diplomacy”. 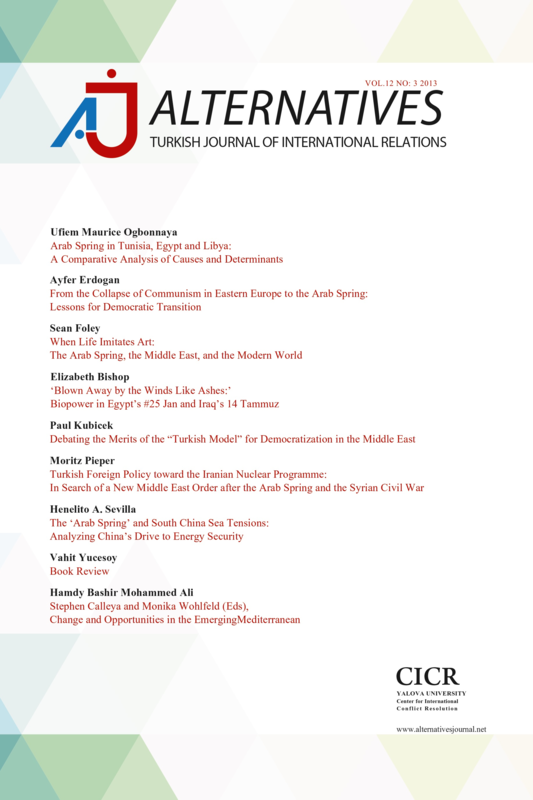 London: Moton and C.
Alternatives: Turkish Journal of International Relations, Vol. 6, No. 3 &4, Fall & Winter 2007 58 Curtis, M and Gitelson, S. (1976) Israel in the Third World. New Brunswick, N.J.: Transactional Books. Gambari, I. (1980) Party Politics and Foreign Policy: Nigeria under the First Republic. Zaria: ABU Press. Hermann, C.F. (1990) “Changing Course: when governments choose to redirect foreign policy”. International Studies Quarterly 34(1):3-21. Holsti, K.N. (1990) “The Comparative Analysis of Foreign Policy: some notes on the pitfalls and falls to theory”: In: The Political Economy of Foreign Policy in Southeast Asia, David Wurfel and Bruce Burton (eds.) London: St. Martin’s Press. Macridis, R.C. (ed) (1972) “Foreign Policy in World Politics” (4th ed). Eaglewood Cliffs, N.J: Prentice Hall. Mathews, K. (1987) “Nigeria and the Middle East”. In: Alternative Future for Nigeria, S.O. Olugbemi (ed.). Lagos: Political Association of Nigeria. Nereus, N. (1993) “Influence of Domestic Factors on Nigeria-Israel Rapprochement”. Annals of the Social Sciences Council of Nigeria 5:16. Northedge, F.S. (1968) “The Foreign Policies of the Powers”. London: Faber and Faber. Nwankwo, G.O. (1984) “Nigeria and Organization for Petroleum Exporting Countries (OPEC). To be or not to be?” London: African University Press. Nweke, G.A. (1986) “Domestic Structure and Processes of Nigeria’s Foreign Policy”. In: Nigeria’s External Foreign Policy: Twenty-Five Years, Olusanya and Akindete (eds.) Ibadan: University Press Limited. Ojo, O. (1986) “Nigeria and Israel. In: Nigeria’s External Foreign Policy: Twenty-Five Years” Olusanya and Akindete (eds.) Ibadan: University Press Limited. Olajide, A. (1976) “Ghana and Nigeria, 1959-1970. A Study in Inter-African Discord”. London: Rex Collings. Olaniyan, R.O. (1988) “Foreign Aid, Technical Cooperation and Foreign Policy in Nigeria”. In: Economic Development and Foreign Policy, O. Olusanya. Lagos: Nigeria Institute of International Affairs. Otubanjo F. (1990) Foreign Policy Analysis. Unpublished. Pandem, J.N. (1986) “Ahmadu Bello-Sardauna of Sokoto: Values and Leadership in Nigeria”. Zaria: Hadahuda. Phillips, J. (1973) “The Development of Nigerian Foreign Policy 1960-1966”. Ibadan: Ibadan University Press. Synder, R.C. (1962) “Foreign Policy Decision Making”. New York: Prentice Hall. ISNAD Kasali M. Adegboyega, Terhemba N. Ambe-Uva and , Adegboyega, Kasali M. . "The Impact of Domestic Factors on Foreign Policy: Nigerian/Israeli Relations". Alternatives: Turkish Journal of International Relations 6 / 3&4 (December 2007): 44-59.